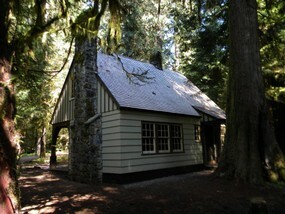 La Wis Wis Guard Station cabin was built in 1937, and is an important piece of Gifford-Pinchot National Forest history. It is one of only two structures of its design in the region. The cabin is situated in beautiful La Wis Wis Campground just off US Highway 12, in the Cascade Mountains near the southern entrance to Mount Rainier National Park. Old-growth cedar and Douglas fir tower overhead, and the Ohanapecosh River and Clear Fork of the Cowlitz River create an idyllic setting. The project began in 2012, and its participants have added to the storied local history of the Guard Station. We will continue this tradition and dedication this year during ‘Part VI’ of the ongoing project – we hope you will join us in the effort to put this incredible historic resource back into use!